Ever feel like you can’t think because there’s just too much going on? You’re just buzzing from one task to another, busy with school, work, chores, church activities? It seems like each day just melts into the next, and, before you know it, another weekend has gone by and it’s time to start all over again. As girls, we like to multi-task, and there are times we’re quite good at it. It’s nice to enjoy that feeling of accomplishment when we look back and see all of the things checked off of our daily list. Sometimes I get so busy that I get this incredible urge to stop, and get in a quiet place for a little while. 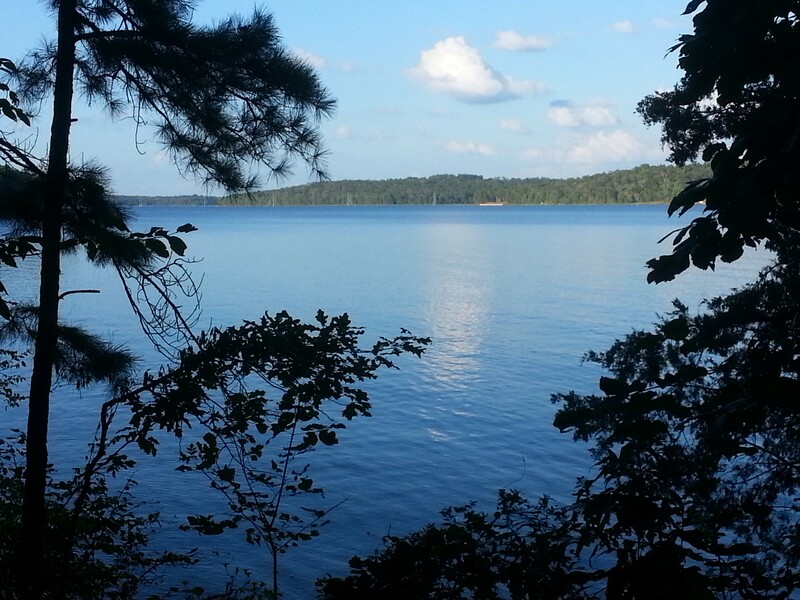 The photo above is a view from one of my favorite wooded trails at Lake Nacogdoches. It’s very relaxing for me to walk there after a long day of work, or on a warm Saturday afternoon. There’s no phone ringing, no tasks clamoring for my attention. It’s quiet, serene, familiar. It is here I find I can relax, refresh, reflect. Sometimes the Lord uses this time to speak to my heart about things, remind me that He is still at work, that He is still God. Sometimes I’ll take a good book or my Bible and read and receive something renewing from my Father. Sometimes I’ll just pray as I walk along the lakeshore. I’m reminded of the title of an old hymn, “Take Time to Be Holy”. If we don’t make time to be still and spend time alone with God, we won’t have those times, and we miss a chance to have a closeness with Him, to let Him speak to us. It is in those times that He refreshes us and strengthens us for what lies ahead. Without it, we stagnate and weaken. Oh, we probably still get a lot of things accomplished from day to day. But are we missing what is truly most important? I am sorry to hear you are going through such a crazy time. We are glad to hear that your reading of our blog was a little bit of encouragement during it!